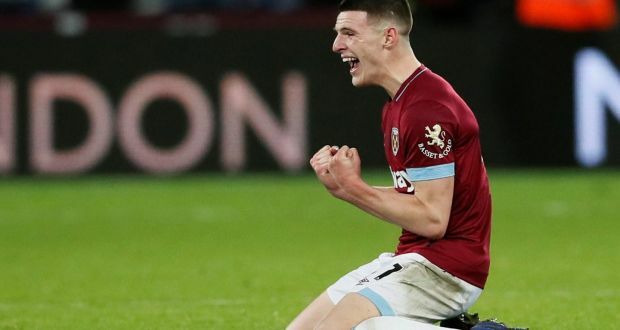 Is Declan Rice the long term replacement for Fernandinho at Manchester City? In December, Manchester City’s title chase came close to getting derailed following back-to-back defeats against Crystal Palace and Leicester City. Man City were poor in attack and were finding it tough to create clear-cut chances. A closer analysis revealed that they were slower than usual in transitions, be it from attack to defense or from one side to the other in attack. The reason for these shortcomings was solely down to the absence of one player, Fernandinho. Such is the importance of the much maligned Brazilian CDM that the Pep Guardiola system of play unravelled in his absence. Fernandinho, even in his mid-thirties (33), is extremely important and irreplaceable in the City lineup. In his absence, Pep deployed Ilkay Gundogan, the former Borussia Dortmund player, but Gundogan had obvious deficiencies. While Gundogan was brilliant on the ball and made those Ramsey-esque late runs into the box, he was unable to thwart the opposition counter-attacks and was caught napping a lot of times. With no natural replacement for Fernandinho in the line-up, Guardiola was also forced to play John Stones in that position in one of the games. But with the season coming to a close and the summer transfer window fast approaching, Guardiola will be hoping to secure the CDM position at Man City for the long term. Man City fought hard for Frenkie de Jong, but in the end, FC Barcelona flexed their financial muscle and pushed that deal across the line. The second choice in Guardiola’s list is Declan Rice. The West Ham midfielder, who started his career at centre-back, is a hustling central midfielder who has been a mainstay in a largely inconsistent West Ham side. After playing just 1 half in the first 4 games, Rice put in a man of the match display in West Ham’s impressive 3-1 victory over Everton, which was also their first victory of the season. Since then, Rice has played in 27 Premier League games, shielding the back-line and keeping the play ticking with positive forward passes. Clearly, Declan Rice is as good as, if not better, than Fernandinho defensively. That is to be expected of the young Englishman, given his background as a centre-back. But what is extremely impressive is his passing statistics. Declan Rice has more than 85% pass completion rate, which is really really good for a Central Defensive Midfielder. It is also fundamental to Guardiola’s system to have a CDM who can pass with accuracy. What makes this passing accuracy figure even more impressive is the fact that more than 27% of his passes are forward facing. This figure compares with that of Fernandinho, with the stats indicating that Declan Rice is better defensively while matching Fernandinho pound-for-pound in passing skills. While Rice needs to learn to shield the ball better, getting dispossessed 0.64 times/game, he is just 20 years old, meaning that he is only going to get better. And if he is performing at the same level as Fernandinho right now, Man City will be buying a player who could, as mental as it sounds, be an upgrade on the Brazilian. The only minor issue Man City will be facing when fighting for his signature will be the fact that Rice has just signed a new long term contract at West Ham. This will mean City will have to splurge out a huge sum of money to secure his signing. But if Rice continues to perform at the level he has been playing this season, he will be worth every penny and will walk seamlessly into the star studded lineup of Man City in the place of Fernandinho.